George Inness (1825-1894). 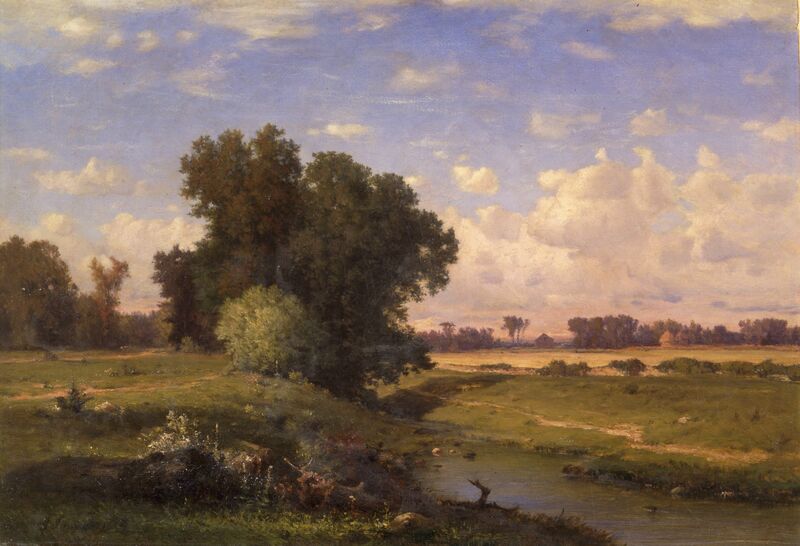 “Hackensack Meadows, Sunset,” 1859. Oil on canvas. The New-York Historical Society. In 1825, three paintings in the window of a New York City bookshop caught the eye of Colonel John Trumbull, distinguished painter of the American Revolution. Depicting the rugged landscape of the Catskill Mountains, the paintings displayed an unfamiliar conflation of wildness with idealism. The artist was the twenty-four-year-old Thomas Cole. Within a year, his work had attracted a circle of artists and patrons who would launch what would later be called the Hudson River School of painting. Forty-five examples of this school and its spin-offs are now on display in Milwaukee, on loan from the New-York Historical Society. Cole had first studied painting with an itinerant frontier portraitist, and his landscapes appear like flattering portraits of specific countryside rather than pastoral fantasies. His mountains and valleys have character that is distinctive and identifiable as well as rational, and noble. His skies have an inner glow of wisdom and satisfaction. For Cole, America is a good, big-hearted, spacious land, though not especially sweet and gentle. There is great variety among those who follow. Asher Brown Durand was an engraver who switched to oil painting. Focusing on detail, he rendered each branch, tree and rock as performers on a panoramic stage. John Frederick Kensett studied in Paris, and paid as much attention to the subtle art of European painting as to the American countryside. Jervis McEntee feels like a melancholy poet, Jasper Cropsey seems to be promoting real estate, and Albert Bierstadt paints to entertain a large cheering crowd. Louis Mignot is well on the way to Symbolism, while George Durrie’s winter scene is suitable for popular calendar illustration. The most fascinating variant is the five-painting series, “The Course of Empire,” done by Cole himself. He tells the story of civilization with cinematic vistas and an incredible cast of thousands. Had he arrived in Manhattan a hundred years later, he might have made movies instead. “Nature and the American Vision” is on view at the Milwaukee Art Museum through May 8, 700 North Art Museum Drive, Milwaukee.